President Duterte’s spokesman has poured scorn on an international survey that named the Philippines as one of the least peaceful countries in the world. 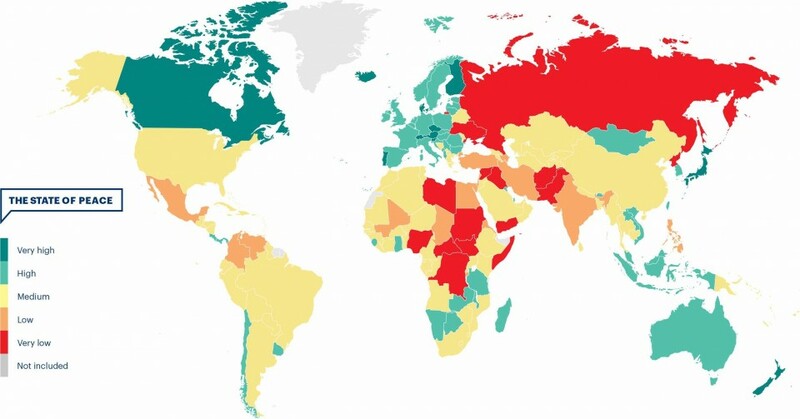 According to the independent Global Peace Index (GPI) the country was was only one spot above North Korea in the Asia-Pacific region. Malacañang spokesman Ernesto Abella suggested there might be a “political slant somewhere” after the annual report said the country’s fall down the index was due to the war on drugs. “We’re not entirely sure where the GPI analyst, who apparently is supposed to be local, is really coming from. Maybe there’s a politically slant somewhere,” Mr Abella said at a press conference today (Friday, June 9). “Maybe there is a political slant somewhere, but based on results, based on survey, the Filipino satisfaction is quite high,” Abella said. The study, which covered 163 countries, was conducted by the Sydney-based Institute for Economics and Peace and is based on 23 indicators of the violence or fear of violence. Researchers insist it is entirely neutral. Mr Abella, on the other hand, said local surveys had found that 75 per cent of Filipinos were happy with the current administration, 62 per cent satisfied with its campaign against crime, 64 satisfied with the fight against terrorism and 76 happy with efforts to help the poor. “Based on these survey results, the net satisfaction of Filipino people is quite high,” he added. He also pointed to a recent survey that showed that eight out of 10 people felt safer because of the war on drugs. This was in stark contrast to the GPI report, which said the Philippines got a lower score because of the president’s “bloody war against drugs and crime that has been extended nationwide”. The report concluded: “The Philippines’ homicide rate, incarceration rate and number of deaths from internal conflict have all deteriorated. Among the 163 nations covered by the study, Iceland is the most peaceful followed by New Zealand and Portugal. The Philippines limped home at 138th place, four places down from its position last year. The study, the 11th of its kind, said that largest deteriorations were recorded in Ethiopia, Burundi, Saudi Arabia, Mali and Lesotho. Another global report released last week found that the Philippines was a worse place for children to grow up than North Korea. 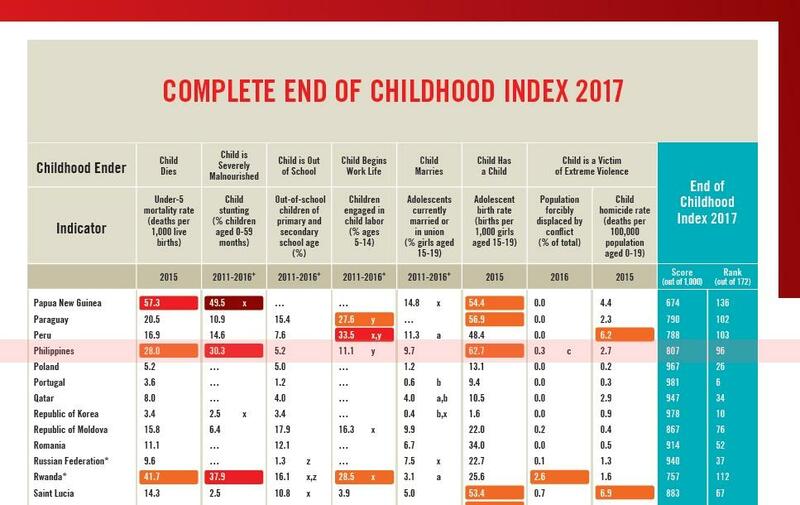 The Philippines ranked 96th out of 172 countries in the End of Childhood Index 2017, released by Save the Children on June 1. The report ranked countries by comparing data on childhood mortality, stunting, out-of-school children, early marriage, teenage pregnancy, internal displacement due to conflicts and childhood homicide. Among these indicators, the Philippines did worst in child mortality, stunting and teenage pregnancy. The country lagged behind Southeast Asian neighbours Vietnam (92), Thailand (84), Malaysia (65), Brunei (64) and Singapore (33). The Democratic People’s Republic of Korea (North Korea) ranked in 78th place.